One of the more interesting questions I was asked while pursuing my college degree was, “What are your career goals?” Twenty (!) years later, I wish I had been asked, “What do you want to do with your life?” as the path I would have taken originally would have been dramatically different. Yet we all know, master plan or not, that we do what we do as a means of learning who we are, what we are passionate about, what lights us up and brings joy into our live.. I had spent my entire professional career selling some type of high technology solution to senior executives at major corporations around the world. Whether as an individual contributor performing front line sales, or a regional sales director with the mission of guiding, inspiring and empowering a sales team, it was always about all things technical – and all things financial. When I graduated from college, I headed for New York City, because that’s what an Ivy educated New Jersey girl did back then. My pride and ego told my parents I was officially and financially independent and the lure of the “technology” dollar was enough to stay my desire to follow my heart into the culinary field. and much financial management, I realized I could do this. More importantly, I wanted to do this right. I wanted to learn about every aspect of this industry and leave myself open for possibility. My plan may have been to own, operate and manage a restaurant immediately, but after formal training at Scottsdale Culinary Institute, I discovered daily additional passions for a variety of aspects I had not considered. on this path I knew I was moving in the right direction. Now I am beyond certain. I have also learned that I love helping other people achieve their full potential in the classroom, the kitchen or a combination. It is for this reason I started up the instructional side of Celebrated Cuisine, offering a variety of classes that focus on technique, flavor combinations, palate balance and presentation. the elegant events side of Celebrated Cuisine more than satisfies that desire. 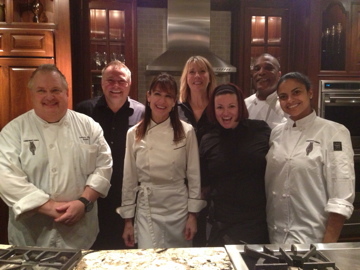 Acting as a private event chef, I bring the fine dining experience into my clients’ homes. Whether a private four course dinner for two, a wine dinner for forty, or an elegant buffet for 200, my clients enjoy all the aspects of fine dining in their own homes, featuring customized cuisine and wine options, five star service and unparalleled attention to detail. I continue to learn, and every day I have the opportunity to share that newfound knowledge with my students and clients. So, ask me again – “What are my career goals?” – well, they are life goals, and I am living and achieving them every single day.